This Hanging Black Hooded Shrunken Human Skull Shape Flashing LED Lamp Ornament with Jewel Eyes is to die for! Dress up your gothic haunted house with this ghoulish killer lighted morphing skeleton head for holiday home decor or throughout the year. A creepy way to provide your guests with mood setting light to haunt their Halloween! Battery-operated blinking LED bulb hollow molded plastic ornament lamp hangs from windows, doors and ceilings without the hassle of electric cords. 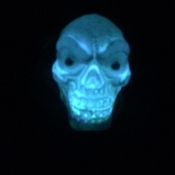 Shed some spooky glowing light on your Halloween scene with this Hanging Black Hooded Lighted Skull. LED Multicolor light bulb features assorted color gem stone eyes, such as pink, green and crystal. Multicolor Lights cycle from blinking and flashing to an eerie morphing glow. Complete with black fabric hood and hanging string. Requires 1 x 3.0V-CR2032 button battery,YES- included FREE!!! Approx. 4.5-inch (11.25cm) high x 3-inch (7.5cm) wide x 4-inch (10cm) deep.